Debate over where to locate a cell tower on rural Chappaquiddick has gone on for years. The Edgartown planning board voted 4-1 to approve the construction of a 115-foot AT&T cell tower on Chappaquiddick Tuesday night. The vote caps years of protracted debate surrounding the proposed tower, with four of the five planning board members ultimately deciding that the tower’s potential to improve cellular service on the Island outweighed concerns about location and safety. Vocal opponents who oppose the tower at its planned location said they will appeal. Two years ago, the planning board approved the construction of a temporary tower at 14 Sampson avenue as the proposed permanent tower to address concerns from the Edgartown fire and police departments about cellular accessibility on the small rural island which has a single paved road, no commercial zoning and is served by a three-car ferry that crosses the Edgartown harbor channel. Mr. Morgan said the past 24 months had proven the tower’s value to the Chappy community. Board member Fred Mascolo agreed that improving wireless connectivity and cellular accessibility were paramount in his decision to okay the permanent tower. Mr. Mascolo held up his cell phone. “We all are,” he added. One day prior, Mr. Strayton submitted a petition to the Edgartown selectmen with more than 100 signatures asking Edgartown to consider building the tower on town land rather than its current location on Sampson avenue, a small neighborhood of modest homes. Because the petition received the requisite number of signatures, it will automatically go on the warrant for the next special town meeting. Board member Lucy Morrison was the lone dissenting vote in the decision. Mr. Strayton agreed with Ms. Morrison’s assessment. All construction projects in Edgartown must comply with town bylaws and are subject to approval from the planning board. They may also face concurrence from the Martha’s Vineyard Commission. After the planning board signs its decision to approve the construction of the cell tower, members of the public have a period of 20 days to submit an appeal. The Straytons said they plan to do exactly that, emphasizing that the fight is not over. “Oh yeah, we’ll be here in two weeks,” Mr. Strayton said. Okay, great, how about now we focus on installing enough radio towers on the island so our portables work at scenes anywhere on the island and we stop being put in danger by archaic infrastructure that wouldn't fly in any other county? First Responder is right. Cell towers and cell phones are not a satisfactory solution for police and fire. First, cell phones are a point-to-point connection, one-to-one. Radios, emergency services radios are point-to-multipoint. When a member of the police or fire department broadcasts on their radio, everyone else knows instantly what is happening. Radios improve not simply communications for police and fire, but their responsiveness. When a member of our emergency services makes a call on their radio everyone knows the issue, and everyone can take the proper actions. They can coordinate responses much more quickly and effectively "you go here, you do this; you go there, and do that." Everyone is on the same page with radios. Better, more effective response from EMS. Cell communications are a useful adjunct, and have benefits contacting EMS, but they are absolutely no substitute for properly functioning point-to multipoint radios for our emergency personal. One interesting point on that subject, was in the RFP for a cell tower on town land in 2015, was a provision from the company awarded that contract to offer free equipment for police and fire. AT&T offers nothing. Whereas the town-land RFP offered rent and revenue-sharing with the town, money that could be specifically earmarked to improve emergency radio communications. A tower on a better, higher location, with better signal propagation improves not just cellular communications, but EMS radio communications. Better, safer, more complaint, less negatively impactful. Shame on the Planning Board!Their argument is ludicrous...“What it boiled down to for me is the question of public safety,” he said. “I think the pros of the tower outweigh the cons.” No one questions that. It is simply a matter of location. This smacks of small town government corruption and think their needs to be an inquiry into why AT&T and the Board are adamant about this location. Why??????? What a ridiculous accusation to say corruption is involved. Sounds like NIMBY more than anything else. Kudos to the board finally making a decision. And a right one, at that. The only one making accusations are the people wielding the word “Nimby”. First accusations were made at opponents of this poorly thought out scenario by accusing them that they did not cate enough about public safety or communication capabilities. Now comes the new chestnut to hurl — Nimby—-. Maybe we could cut back on the name calling and just look at the dacts that Were brought forward and the ones being cited by the newest member of the Planning Board? Sad that Chappaquiddick could not find a way to avoid a tower by having a Distributed Antenna System. That is what Nantucket has. Maybe it could still happen. Nobody thought that Chappy could get Comcast. We worked with Comcast and they made it happen. With their systerm of Fibre Optric cable on Chappy, we are maybe a big step clodser to DAS. Maybe Comcast could help once again. Lionel, I agree, it is a sad day for all of us that love and cherish Chappy. For all of us that feel we are simply stewards and guardians for the time we are here; that it is our obligation to preserve this most unique and special place for the generations to follow. This cell tower in this location is an affront to anyone that cares about Chappy, cares about Martha's Vineyard. There are other alternatives like DAS, or small cell, and you are correct, the Comcast Fiber is a big hurdle overcome to deploying DAS Chappy-wide. There are municipalities, right here on Martha's Vineyard that took it upon themselves to safeguard their citizens and their towns by proactively deploying DAS. By exhibiting the leadership and good judgement to build out a DAS towns like Chilmark and Aquinah provided a way, under federal law, for carriers to address a known coverage gap without having to erect a cell tower. Edgartown could have exhibited the same leadership, thoughtfulness and stewardship as our neighbors Up-Island. They didn't, instead they left Chappy up for grabs to the greedy and washed their hands of this challenge. It is poor governance and all of us in Edgartown should consider very carefully when it come time to vote for those that would inflict such grievous harm upon this landscape when better, less impactful alternatives exist. For half the price of a Yellow House, Edgartown could have built the DAS the majority of residents wanted, and requested. It may not have solved the Trustees problems, but when was the last time the Trustees showed up at your house to solve a problem for you? Distributed Antenna systems are more expensive, require much more equipment, in many many more places. Distributed Antenna systems are meant for Venues, Stadiums, Office Buildings, and sometimes dense urban environments. This is not a viable solution. First, I was out on Norton Point Beach yesterday and had perfect reception with my ATT iPhone. Second, the final tower will be 15’ taller than the current, temporary tower, and thus it will improve coverage. Jared, how many people were out on the beach with you yesterday, a week-day in the middle of September? As I noted in my comment, I was there on Labor Day weekend and there were probably about 100 cars on Norton Point with a few hundred people on the beach. The simple fact is that the tower could not handle the demand for cell service and did not provide adequate coverage. I could not place a call, access data, etc. and my family can attest. Busy weekends in the summer are going to be the highest risk for an incident on Chappy by sheer power of numbers. I also have a brand new AT&T iPhone, so it clearly isn't the device that is causing an issue - it is the location of the tower. Why hasn't the town considered locating it on a property with higher elevation where our beaches would be more adequately covered, and the safety of summer visitors on peak days of the season would be 100% ensured? That is exactly the point. The proposed tower cannot provide adequate coverage. It is located 19 feet above sea level. One quick look at the coverage maps shows that the only way a tower sited on Smapson Ave can provide meaningful coverage is to raise the height to nearly 140 feet. In fact, AT&T testified the "line of sight to the beaches' from Sampson Ave is 140 feet. The Landlord emailed the town to say a 140' tower would be a non-starter in the community. better to start at 120 and simply invoke Section 6409 of the Middle Income Tax Relief Act of 2012 (Why cell stuff is contained in THAT Bill is a great question for your federal legislators??) that permits, by right, federal law, that grants the carriers the RIGHT to raise the height of a tower without any ability of the town, or the MVC to deny that height extension! The Board approved a 117' foot tower, but it will not remain at 117' it is going higher, and the impacts, the views from across Chappy, particularly the beaches, "the park" as Mr. Mascolo likes to call it, will be even more adversely affected. Placing a smaller tower on higher ground is not simply less impactful, it provides better coverage to more of Chappy, and Edgartown. Look at the 2011 AT&T Engineering Report, and what it says is that 29 Old Indian Trail, a 7.7 ace town-owned site, surrounded by 58 acres of woods, 49' above sea level is the best place on all of Chappy to site a tower. AT&T says a 120' tower there provides 16.51 square miles of coverage. Not just Norton Point, but South Beach down to the Great Pond, Katama out to the West Tis Road, redundant coverage of downtown Edgartown, as well as every inch of Chappaquiddick. 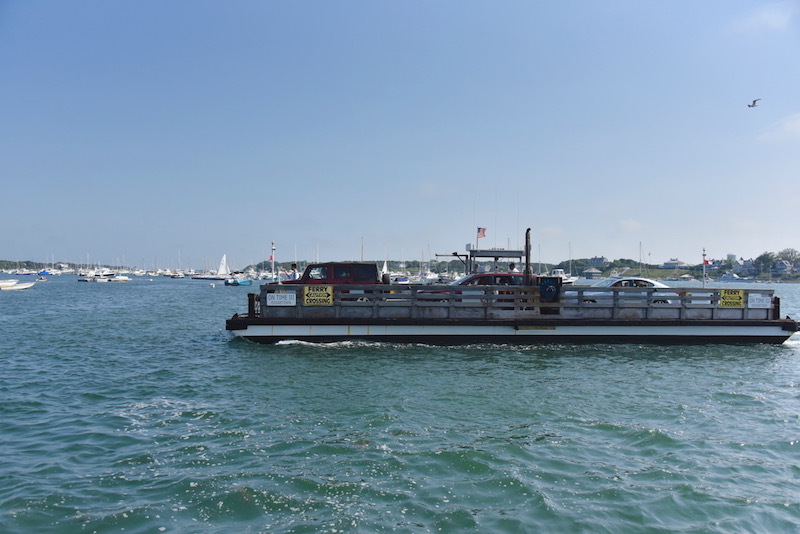 That site is better, from an RF standpoint, more complaint with the Bylaws, less impactful to the people of Edgartown, remains under the control of the town and its citizens and provides revenue in the form of rent and revenue-sharing. So Why again is Sampson Ave the best spot for this tower? I am still waiting for one valid technical reason for why Sampson Ave makes any sense?? Very disappointing to witness how close-minded and intractable the planning board has been. The board jumped the gun and refuses to step back on what was a rash decision. The only planning board member who displayed any wisdom was Lucy Morrison who is quite correct that this decision undermines residential and zoning laws which are the only protection landowners have in ensuring their safety. For the Board to continue their hypnotic chant on safety and communications --- this is NOT the issue --- the issue is that there was Town owned land and alternative sites that were non-residential, proved to provide better coverage, and would allow for more flexibility to grow and expand over time. Why the Board refuses to acknowledge this in their comments and deliberations (with the notable exception of Ms. Morrison!) is a complete mystery and delivers a tragic outcome for multiple landowners in the only densely populated neighborhood on Chappy. How can the Board remain so blind? What happened to Chappy 3 acre zoning? This site is one of the smallest if not the smallest, densest with the most homes and has residences within a possible drop zone. Chappy has several town owned properties with higher elevations and therefore better coverage and can generate a sizeable income stream to the town This very site was turned down several years ago for the same request by a more conservative planning board because it did not comply with zoning. With this approval, expect to see more requests for towers in other dead zones in Edgartown, like Katama. I have read of at least two other parcels being available, with an overwhelming majority of Island residents' approval, right now. I have read that Verizon is on record in concurring that those two town locations are far superior. Was that offer not formally extended to AT&T? What say you, AT&T? Nevermind the tired arguments about whether the Sampson site is sufficient or safe, that's been discussed. It's sufficient, however objectionable, in its final 140+ foot configuration. I want to know why the other sites aren't as superior, technically and economically, as they seem to everyone except the Planning Board, the site owner, and AT&T.